Our UI library ships with lots of useful color selection tools. 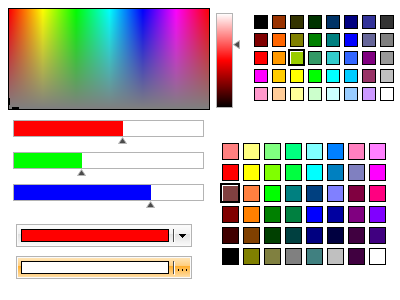 This screenshot demonstrates the following: NColorPool, NColorBar, NLuminanceBar, NPaletteColorPane and NColorButton. Our NTooltip component allows you to display rich text formatted tooltips with ease. Completely customizable, our tooltip will bring to you the latest Office 2007 standards and appearance.